The goal of DYNAFREIGHT (Innovative technical solutions for improved train DYNAmics and operation of longer FREIGHt Trains) is to provide the necessary inputs for the development of the next railway freight propulsion concepts within Shift2Rail. The project contributes to overcoming the problems of operational and technical nature that have been negatively affecting the overall capacity, performance and competitiveness of the EU rail freight industry. 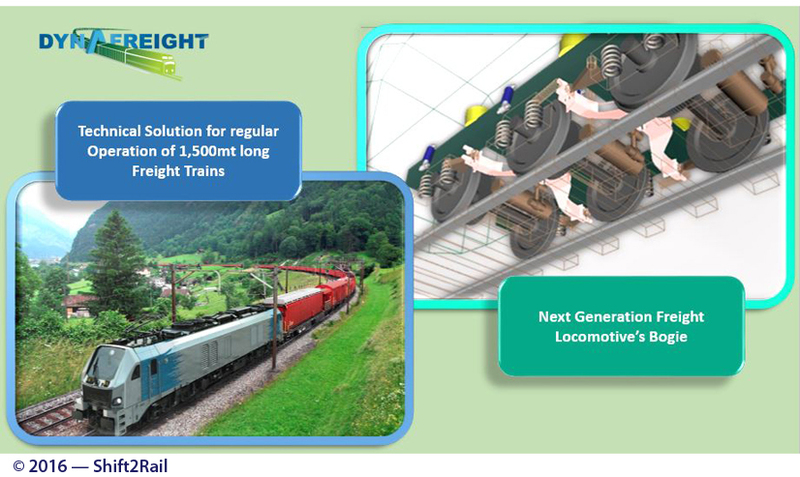 Freight running gear for locomotives: DYNAFREIGHT designs and develops the necessary concepts that will allow a locomotive freight bogie to reduce wheel and track wear, to have lower noise and lower LCC. Operation of long freight trains: following the outcomes of MARATHON, DYNAFREIGHT prepares the path for regular operations of long freight trains.